Here’s an upcoming event that every true fashionista should check out. Doyle New York auction house, will be offering couture items at their upcoming High Society Sale curated by noted fashion historian Caroline Rennolds Millbank. Included in the sale will be some fabulous vintage costume jewelry by most of the top designer names, the coveted Hermes Birkin bags and other designer handbags, as well as the classic Vuitton trunks, plus beautiful fashion sketches and lots more. 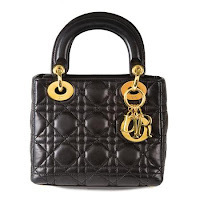 Some of the timeless items will include a black quilted Lady Dior handbag from the ‘80s (estimated at $100-150), Dior’s black calf handbag with tortoise bracelet handles from the 1960s ($200-250). 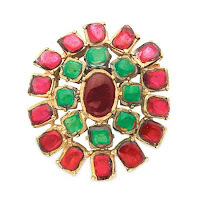 Chanel’s knockout brooch designed by Gripoix in the ‘80s. It’s gold plated metal set with emerald and rose pate de verre stones ($400-600). However if you’re really feeling flush why not bid on the two heraldic brooches originally owned by Diana Vreeland. The first consists of a silver-tone metal pin/buckle enameled in white, green and red with a crown, Maltese cross and laurel wreath. The other is a gold plated pin molded with the Royal Arms of England including the royal family’s mottoes. The estimate is steep ($750-1,000) and will probably exceed it, but if nothing else, these two gorgeous pieces will only go up in value over time, not to mention look absolutely gorgeous on your H& M or other bargain basement outfit. Listen, a girl’s gotta cut back some where! Chanel's Brooch - Finally, the Good Parts of the 80s are Back! The exhibition preview dates are October 31 – November 2, with the auction held on Tuesday November 3rd. For more info log on to DoyleNewYork.com.